Mentioned is the way you can write Security Guard CV Template. 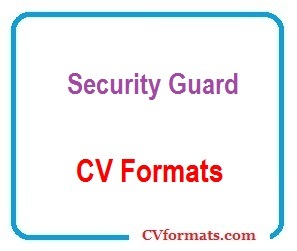 People looking for jobs can easily download these Security Guard CV formats in editable pdf and MS-Word (.doc) formats or you can just copy and paste from or website CVFormats.com and app. Cover letter of Security Guard CV Template is also available. Just change the name , address , qualification and experience and your security guard CV template and formats are ready. I am looking for a job as a security guard in a reputed Security agency where my experience will be utilized. Monitoring the facility and preventing loss. Protecting the occupants of the facility. Patrolling the property to protect against possible hazards. Maintaining reports and keeping the management informed about all the security issues. Immediately responding to security violations, alarms, and other emergency situation. Maintaining sound judgment and confidentiality at all times. Certification in fire arms handling and first aid.